great work on the photos by Sandra! Oh, check out that that foam...and yes, I would've packed in those doghnuts as well! @Shellie - Thanks Shellie! I've passed your feedback on to the boss ;). So excited for pudding. Like, ridiculously excited! @Adrian - The foam was incredible! Loved it! Yeah I ate like 3 donuts, oops! Good stuff. 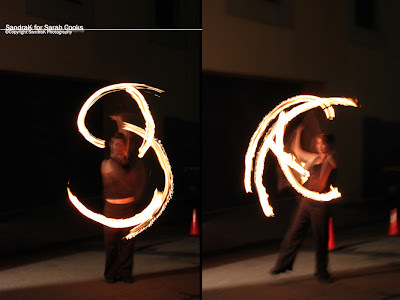 Love the S and C fire swirls. Wish they did a T and D :-( Weren't those cocktails and donuts amazing? Wow! Just look at the form of the foam! Can't imagine that was soy on top of the piñacolada. Looks like it would be fun joining that event. Wish I could be there, but I'm like million miles away. Great photos!